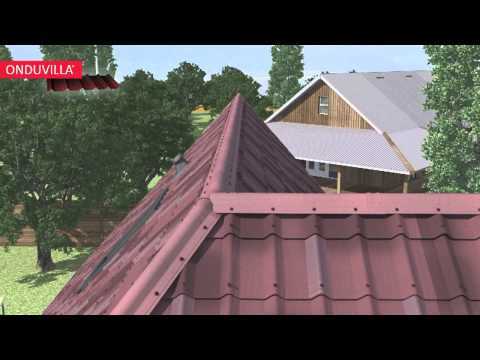 ONDUVILLA is a bitumen based roofing tile. It's a complete, aesthetic and unique roofing solution for your roof. With its high quality, ONDUVILLA system meets the international standards related to environment and sustainability. Enjoy the Mediterranean-style look. Choose from a selection of attractive colors and shades. Refine your roof installation with our newly designed accessories. The elasticity of ONDUVILLA composite material allows it to shrink around each fastener, creating a leak-resistant barrier. The waterproofing is secured thanks to the double-embossment technology at the overlaps. Achieve long-lasting watertightness and a lifetime warranty against corrosion. Install the tiles on continuous deck. Simply nail the tiles. No glue needed – just a hammer, nails and cutter will do it. Install your roof quickly with little effort. At just 4kg/m², they are easy to transport and handle. ONDUVILLA consists of about 50% recycled material, a best-in-class product! ONDUVILLA is a roofing material that is light and easy to install. It provides a very elegant appearance to all types of roofs. On top of its performance and its light weight, ONDUVILLA has three appealing color option which look like Mediterranean tiles! The perfect solution for renovation or new buildings. Thanks to its unique material, ONDUVILLA attenuates rain noises. Ideal to keep animals quiet! For new buildings or renovations, a roof has to be fastly installed and reliable not to disturb the activity inside the building. ONDUVILLA is the perfect roof solution, combining ease of installation and long lasting waterproofing. Roof is a large and visible part of a commercial building or a resort. A nice looking solution on the roof will tease everyone and will differentiate the premises from others with ONDUVILLA. Ride the wave of perfect waterproofing! A solution of the future, ONDUVILLA gives you an ideal alternative to concrete and clay tiles, as well as metallic tiles and shingles. They’re watertight, reliable and eco-friendly. Thanks to thermal comfort and acoustic performance, life goes on even during extreme heat or rain. Enjoy a unique and complete system at a competitive price. Protect your building faster thanks to rapid installation and stand out in your neighborhood while enhancing the perceived value of your house! Onduline has achieved a low carbon footprint and recycles about 200,000 tons of material each year. Additionally,ONDUVILLA materials are composed of recycled fibers and natural pigments are used for coloration. Like all Onduline products, ONDUVILLA contains no asbestos. On top of this, because of ONDUVILLA’s lightweight which is 4 kilograms per squaremeter, transportation is optimized and the structure needed is a lighter one. This lightweight function makes ONDUVILLA a roofer friendly product which is easy to handle and carry. ONDUVILLA contributes to meet the LEED requirements. Backed by exclusive SealSmart™ technology, the elasticity of ONDUVILLA’s composite material allows it to shrink firmly around each nail, creating a permanent leak-resistant barrier. On the other hand, waterproofing is secured due to double-embossment technology at the overlaps. The material is also resistant to the types of corrosion related cracking that’s common with metallic roofing tiles. As a testimony to our confidence in ONDUVILLA reliability, these tiles come with a 10-years waterproof guarantee plus a lifetime guarantee against corrosion! Developed by the world leader in composite roofing sheets, with a powerful global presence in more than 100 countries, ONDUVILLA solutions are ISO 9001-certified and comply with the strictest standards and regulations. Technology certified through laboratory and field tests. Thanks to a wide range of color options and shades, you have an aesthetic solution that you will be proud of! ONDUVILLA accessories have been designed in order to secure complete waterproofness and provide a distinguished look. It is possible to find all the smart and functional components for a complete roof in ONDUVILLA system. The new System is inclusive of many accessories from ridge end up to verge piece, produced from the same material as ONDUVILLA, hence providing an integrity in the general aspect of the roof. "We used ONDUVILLA on the roof of our building. I really liked it because it is much more aesthetical than clay tiles and easier to apply." "We prefered ONDUVILLA because of its natural and aesthetical shape and its excellent uniformity. It can be walked on very easily and it made possible to save money for the infrastructure. Its flexibility and lightweight are other factors making it "highly recommendable..." Its easy application made the process very fast. According to me ONDUVILLA is the leading product of Onduline Group producing outstanding roofing materials. This means that one can have a high technology product with superior properties which can be used for long years... I would like to express my gratitude to Onduline Avrasya for having produced such a product and to sales rep. having it introduced to me." I had used shingles on all the roofs of my hotel “Oranj Ranch”, that is; on all the villas and farm - except the hostel section. This time, I started searching for an affordable, different, light and tile looking material. We chose ONDUVILLA which has been applied without any problem, with full accessories on 3 different roofs, thanks to commercial and technical team of your dealer Aslan Ticaret in Kemer. Over time, I wanted to see this product on all of my roofs. Brand awareness and technical support are the main reasons why I decided to apply “ONDUVILLA” manufactured by Onduline Avrasya and I would recommend it to anyone with contentment. First, I saw the product on the web, I investigated it and asked the roofer company practitioners. I wanted to see samples when they told me that it was the appropriate material for the roof. Furthermore, when I saw some of the applications I was convinced that it’s a suitable material. I realized at the end of the application that I've made the right decision. Thanks to everyone. ONDUVILLA is being used in Euroasia since 2005 and hundred thousands of square meters have been applied on the roofs. Click here to see the ONDUVILLA references.